It’s no secret that we’re advocates for extended rear facing, so when a car seat comes along with a high rear facing weight limit, we can’t wait to check it out. The Graco Extend2Fit convertible car seat is compact, easy to install, easy to use, has a 50 pound rear facing weight limit, extra leg room for kids, and is under the $200 price point! Many technicians swoon at the description alone. Well, my fellow caregivers and technicians, avail yourself of a swooning couch. The Graco Extend2Fit delivers. Graco has released the Extend2Fit to the Canadian market with the same rear and forward facing limits as the version sold in the United States version. However, the Canadian manual makes a few different rules and recommendations for the Extend2Fit in Canada. Be sure to look at our Canadian review for these important differences. The harness, buckle strap and chest clip are all standard-issue Graco hardware. Buckling in all of the dolls and my daughter was very easy, as expected. The straps did not easily twist, even moving them around as much as I did for all of these sizes. The headrest adjusted easily through all 10 positions, though the flap that lifts as the headrest goes up did get caught under the cover every time I moved it back down. This was quite annoying for me, but most caregivers will not be adjusting the headrest 20+ times a day, so I don’t see it being a large problem at all. The seat has strap covers which have grip on the insides of them, possibly to keep them from sliding down the harness. They can be used rear facing, but they must be removed forward facing. In many pictures in this review, they were removed to show strap height and position. There are two buckle strap positions. Either can be used rear facing, but forward facing the outer position must be used. Even for my 6 year old daughter and doll, when rear facing the inner slot was a very nice fit. Forward facing the outer position also worked well for them. Tip: when changing the buckle position, recline the seat AND pull out the extender fully to access the buckle strap. It’ll make life much easier. The manual states that the extender panel must be in position 2-4 for a child over 40 pounds. That simply means not tucked all the way in. When CSFTL asked Graco if this is absolutely required, since the seat is far more compact without it, they stated that it’s not misuse to keep the extender tucked away. However, if space is of an issue, and a parent is not comfortable disregarding the manual (rightfully so, we’re hoping an official statement comes out that revises the manual), a caregiver can always use extender position two, which is barely extended.There are two cupholders with this seat, and both are required to be assembled when the seat is bought. They click in with ease provided they are in the correct direction. They simply won’t fit another way, so it’s not hard to do. The Extend2Fit includes the Fuss Free pockets for buckle storage when the seat is not in use. That means you don’t need to dig around by your child’s hips searching for the buckle tongues every time you get them in or out. The foot extender sets the Extend2Fit apart from every other convertible car seat on the market. As the child grows taller, the panel can be extended to help them feel more comfortable. While legroom is not a safety concern — children are much more bendy than adults — the extra leg room can make more reluctant rear facers a bit more content. The panel can only be adjusted when the seat is uninstalled. It moves in and out with a squeeze. The adjustable headrest has 10 positions, it’s easy to move from between them. Since the Extend2Fit uses a no-rethread harness, adjusting the headrest also adjusts the harness height. The lowest harness position is 7 inches (with the infant insert in place), while the highest position is 17.5 inches. Graco Extend2Fit Rear facing installation with the lower anchors. Extender in position 1 (all the way in). A lower anchor rear facing installation with this seat is pretty easy. I found it necessary in my car to pull the cover aside to finish tightening the strap (pulling the strap back into the belt path). That was an extra step, but not a difficult one. With the four recline positions available, I was able to have the seat at a newborn recline and upright for an older child without any assistance of a rolled towel or a pool noodle. Installation with the panel out and lower anchors requires some of our reviewers to stand behind the seat and pull the lower anchors directly up in order to get the install secure. We’d love to see a slit added to the cover just over the rear facing belt path or to have the cover be easier to remove around the belt path. That would allow easier access to tighten the lower anchors or vehicle seat belt from inside the seat’s shell. 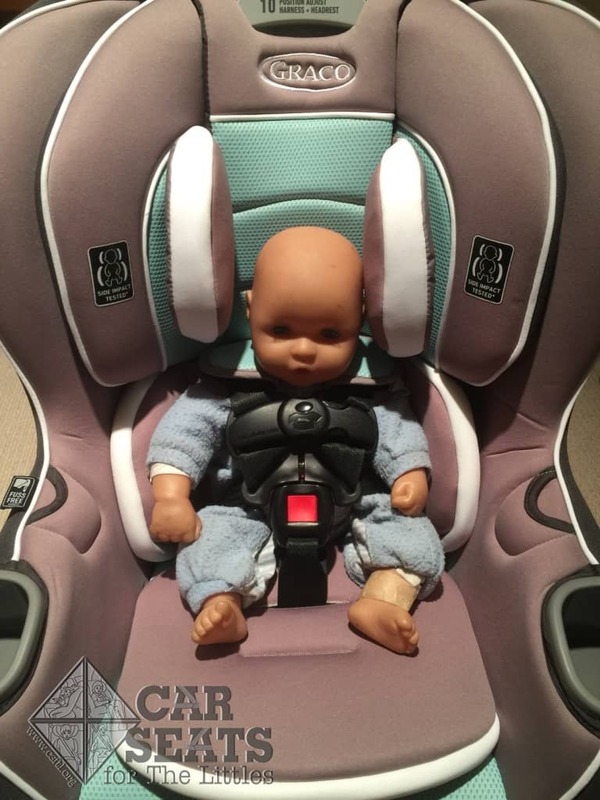 Note: The lower anchors can be used to 45 pounds with this seat, so it’s possible a caregiver must change to the vehicle seat belt installation before the child turns forward facing. Graco Extend2Fit Rear facing vehicle seat belt installation. Extender in position 4, all the way out. The belt path for vehicle seat belt installation is smaller than typical of convertibles, so it took a little more work than expected to thread the vehicle seat belt through the belt path, but the install itself was otherwise easy. The belt path is high enough in my vehicle, and with the extender out, it’s far enough from the vehicle seat back, that I was able to get a good grip on the vehicle seat belt by the buckle and very easily get the slack out. If you have lap and shoulder belts that do not lock before a crash (a car made before September 1, 1996, or you’re installing in an international car with the vehicle seat belt) you will need to get a locking clip from Graco. Like Dorel and Evenflo, Graco has stopped sending a locking clip automatically with their seats. Most cars with seat belts that do not lock before a crash have aged off of the road, so the locking clips are not as necessary. The fit front to back for this seat is remarkable for the size child it fits. For a newborn, my 5 feet 11 inches husband would have been able to fit in front of it, though not quite as far back as he could have liked. The same was true with the extender fully out and the seat upright for an older child. With the extender not out at all, and still fully upright, there was more than enough room for my husband in the front seat. The range for this seat from newborn to older child is quite generous. On the left, the Extend2Fit set up for a newborn. The next panel shows the seat upright with the extender out. Then the seat upright, but the extender in (the headrest is intentionally left down to show size in the car). The fourth panel shows the space gained by putting in the extender. The seat sports six recline positions. Let’s break down the requirements for each position. Recline positions 1-4 can be used in rear facing mode. Children who are less than 3 months old must have the Extend2Fit installed at an angle in the light blue range on the recline indicator. For children who are over 3 months old, any of the blue range on the recline indicator and any rear facing recline are permitted. Recline positions 4-6 are for forward facing use. For children who weigh between 22-40 pounds the seat must be in recline position four. Children who weigh over 40 pounds must use recline position five or six in forward facing mode. Graco Extend2Fit forward facing lower anchor and top tether installation. I installed the seat with the lower anchors simply to see how switching the lower anchor strap would work and to asses the level of difficulty for the install. I found it easier to install the Extend2Fit forward facing than rear facing. With a 45 pound weight limit for the lower anchors, many parents will not use the seat forward facing while the lower anchors are still usable. However, some children may be old enough to safely forward face before they reach 45 pounds, so they may make use of the anchors. To switch the anchors, the manual says to pull the cover aside and slide the lower anchor strap along to the forward facing belt path. I found it a little cumbersome to work around the harness. It might be easier to simply use the lower anchors rear facing, but when switching to forward facing, just use the seat belt. The forward facing belt path is more open than the rear facing one, so seat belt installation is easier in the forward facing position. In addition, if the headrest is moved up to its highest position, it’s easy to get hands under the cover to feed the seat belt through the open belt path. The top tether is stored along to the side in a clearly marked position. There was no issue getting it unhooked and over my backseat toward the top tether anchor. For the fit to child, I used four dolls and my 6 year old. I used a small non standard doll who stands in for my preemie, a Huggable Images family of newborn, 3 year old, and 6 year old, and then my own 6 year old who can give feedback on comfort. Small doll. The straps were above the shoulders, and a crotch roll would have been needed. This doll is very small and soft, but it does a good job of showing that the Extend2Fit will not fit a very small child, even with the insert. A 4 pound preemie or small newborn coming home will likely need a different car seat until this one fits. It may be only a month or two, but most babies on the smaller end of the charts will have a difficult time at birth. Graco Extend2Fit The optional rear facing strap covers were removed to show the newborn strap fit in this seat. This model is a Huggable Images newborn doll who weighs 7 pounds and is 17 inches tall. Graco Extend2Fit A very supportive and fantastic newborn fit. My newborn doll fit very well in this seat. The straps were nicely below his shoulders, and I was able to tighten the harness easily so that it passed the pinch test. With the insert in, fit was good, and he just fit without the insert. I’d be wary to recommend using it without the insert for newborns, however, as they will often slouch a little as the ride goes on, and so his shoulders may end up under the bottom harness height. This charming model with amazing hair is 8 months old. She weighs 17 pounds and is 27.5 inches tall. She’s got so very much room to grow in this seat and it fits her well. This little cutie is 3.5 years old. She weighs 29 pounds and is 38.5 inches tall. She loves her Extend2Fit! She calls the panel her “leg rester.” She enjoys how upright it is so she can see out of the window. This model is 4.5 years old, weighs 36 pounds, and is 41 inches tall. The Extend2Fit is easy to adjust, offers him plenty of leg and growing room, and is comfortable to sleep in. The recline options make for a very compact installation when needed — it fits nicely rear facing in my tiny car. He’s got plenty of room to grow. The lounging six year old doll in rear facing mode with the extender in position four. The doll still had room above the head to grow as the headrest was not yet all the way up. At 45 pounds, and 48 inches tall, this 6 year old doll is very close my daughter’s size. I put the doll in the Extend2Fit in seat both rear and forward facing modes. At just 1 inch from the forward facing height limit (there is no overall height limit given for rear facing), she had room to grow. If she was a real child, she could have grown the last 5 pounds rear facing. Having the option to rear face to 6 years old is not necessary for every child, but for families without top tethers in their vehicles, or for children with low tone or other medical issues where rear facing even beyond 4 is beneficial, the sheer longevity of this seat in the rear facing mode is amazing. It really can get many kids from birth to booster completely rear facing. This model is 6 years old, weighs 45 pounds, and is 46 inches tall. She’s almost at the top end of the height and weight limits for the seat but she’s got one click of headrest left to grow. At her age, she’s able to ride forward facing safely but we’re thrilled to see a reasonably priced option that could last this long! “Can we go for a ride?” My 6 year old, 54 pound daughter, is 46 inches tall. She’s using the eighth headrest position with room to spare above her head VERY comfortably sitting rear facing in the seat *for demonstration purposes only*. My 6 year old daughter also demonstrated the fit of the seat. Even though she is over the weight limit for rear facing, I put her in to show that children very likely WILL get to the full 50 pounds rear facing in this seat. Even tall children, like the 6 year old doll, have allowed us to see that this seat is tall enough to last rear facing. When in the car with the extender fully out, she was quite comfortable and enjoyed the seat quite a lot. She asked to go for a ride in it, though I had to turn her down because she’s over the weight limit. She was quite disappointed. She had a lot of leg room available to her, looking for all the world as if she was in the world’s most comfortable recliner. With the extender tucked into the seat, this model was still comfortable, but had 5 fewer inches of leg room. With the extender completely tucked in, she was still comfortable, and able to cross her legs, but she definitely preferred having more room. Of course, that is one of the benefits of this seat over the other 50 pound rear facing seats on the market. The manual specifies that the panel must be extended when the seat is used with children who weigh over 40 pounds, however Graco has clarified to us that the panel doesn’t need to be out. We’d like to see this information presented in the manual. We’ve seen how long-lasting the Extend2Fit can be for children who ride rear facing, but how does it fit forward facing? Here we see our 5 year old model from above. The seat is installed forward facing on recline 4. He weighs 48 pounds, and is 46 inches tall. He has about a half inch of harness height left in the seat. When going from rear facing with the headrest in position eight, our 6 year old doll needed the headrest in the top (10th) position forward facing. This limited growing room forward facing. For very tall, lightweight kids, it may be possible to outgrow this seat forward facing first (though not much longer after rear facing). Our doll likely has less than a year to grow in terms of shoulder height. By overall height she would have had probably three to six months before she hit 49 inches. However, the doll is 6 years old, an age where most kids are booster ready. I would also care to note that 48 inches tall is the average 7 year old girl, not 6. The 6 year old doll is tall for her age, and still had room to grow. Her height is equal to that of the 90% girl. At this age, the boys are the same percentile with 48 inches being the 90% boy at 6 years old. When a car seat is installed rear facing, it can take up a fair bit of space front to back and make riding a bit uncomfortable for the passenger who’s riding in the seat in front of the the car seat. Sometimes, it seems like the easiest way to create more space for cramped passengers is to turn the car seat around and have the child ride forward facing. That’s not always the answer, especially when the car seat in question has a more rounded, bulkier shell. We’ve illustrated this for you with the following pictures. The vehicle is a 2016 Mitsubishi Outlander and our adult model is 5 feet, 4 inches tall. Please note that every vehicle is slightly different and your mileage may vary in terms of exactly how much space a similar installation would require in your vehicle. Here’s the Extend2Fit installed fully upright in rear facing mode with the panel in. This is about as compact as this seat can be when it’s installed rear facing. Here’s the view from the vehicle seat right in front of this installation. Note that there’s quite a bit of space between this adult passenger’s legs and the dashboard. Here’s the Extend2Fit installed fully upright in rear facing mode with the panel fully extended for an older rear facing child. Here’s the view from the vehicle seat right in front of this installation. Note that there’s still quite a bit of space between this adult passenger’s legs and the dashboard. Now we see the Extend2Fit installed forward facing for a child who weighs less than 40 pounds. This installation requires that the seat be in recline position 4, which is fairly reclined. This requirement means that the Extend2Fit takes up a fair bit of front to back space in the vehicle! The piece de resistance is in the knees. Our adult passenger is now very close to the dashboard. She may even be too close for the airbag to work properly. That’s probably not the result you’d expect from turning a car seat forward facing! FAA Approval: Like other Graco seats, the aircraft approval statement is on the back of the seat, on the left raised rib. This seat is aircraft approved rear and forward facing. At about 20 inches wide, it should fit easily with the armrests up. Rear facing without the extender out it should fit in nearly any aircraft seat. Forward facing it should also be a fairly easy fit. Expiration: The manual states 10 years from the date on the sticker, and the seat is also stamped as such on the back, within sight of the sticker. It’s unlikely this seat will get a single child to 10 years old, but at under $200 for such a fantastically long lasting seat rear facing, and a very nice forward facing seat, multiple children can get use out of it. Manual: There is a manual storage pocket at the lower back of the seat. It’s clearly marked. Manufacturer information: On the back on the inside of the right rib, opposite the aircraft approval statement is the sticker with the model number and date of manufacture. Graco has really done something amazing with this seat. An easy to install, compact, tall, 50 pound rear facing seat for under $200. It really puts it into the area of an astonishing seat for a moderate price. Dual cupholders, always a fan favorite, the easy to adjust harness, the Fuss Free pockets, and the rather revolutionary extender have really made this a spectacular seat. The Graco Extend2Fit is available right now at Amazon!